The entrance to the cemetery. Note the iron fence surrounding a grave immediately behind the entrance. 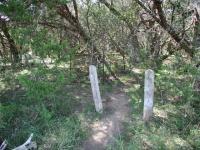 The pioneer cemetery within Pedernales Falls State Park is not easy to get to. It's on the far corner of a multi-mile hike. There is no parking near the site at all. This isolation is one of the factors that make it so intriguing. Unlike many old cemeteries in town that were once in open farmland and now are hemmed in by strip malls and apartment complexes, this cemetery's surroundings very much resemble what they were when the people who are buried here were laid to rest. A wider view of the cemetery. An iron fence surrounding perhaps 3 graves can be seen behind the Cedar tree trunk. 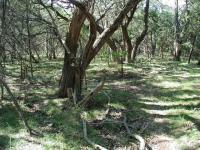 The only way to the cemetery is via Pedernales Falls State Park's 4-Mile Loop hike. The distance out and back from the hike trailhead is at least that distance, so plan ahead if you intend to visit and bring some food and water for your journey. 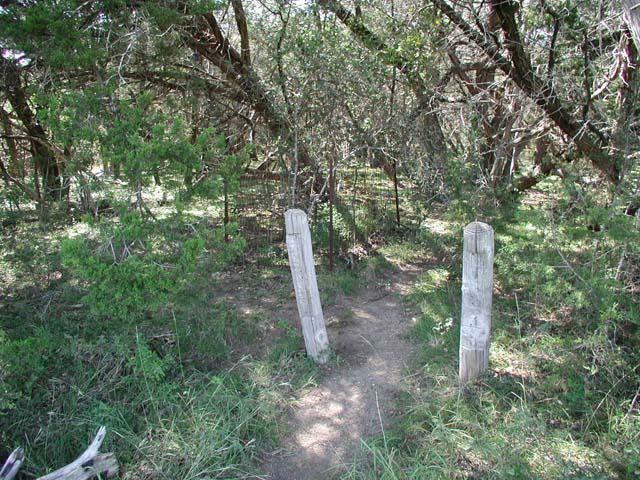 The entrance to the cemetery from the trail is marked by two faded white wooden posts on the western side of the trail. 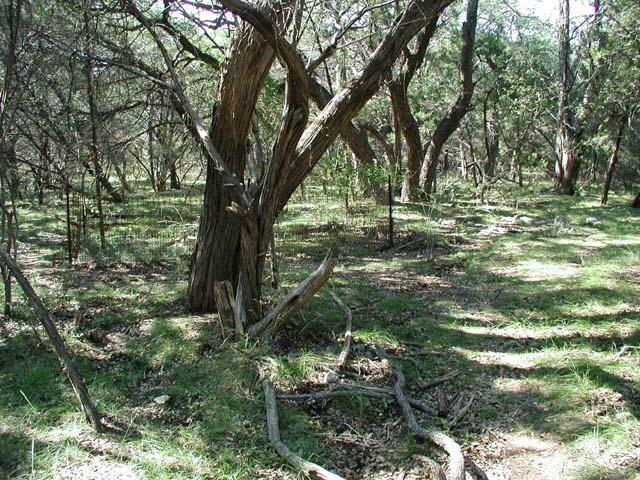 One of things you'll note upon entering is that the cemetery is under a very thick covering of Cedar, which provides relief from the Sun's rays, but also casts dark shadows in all directions. The cemetery is not very large. 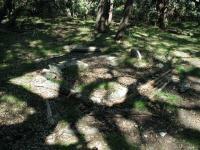 At best there appear to be a half dozen graves that are certain to be present. Perhaps a half dozen more that may just be the figments of the imagination in trying to decrypt the lay of the land in the twisted shadows. None of the graves bears a marker legible enough to provide any indication as to who was buried here and when. By far, the most telling relics of the burials are the iron fences that surround a few of the plots.